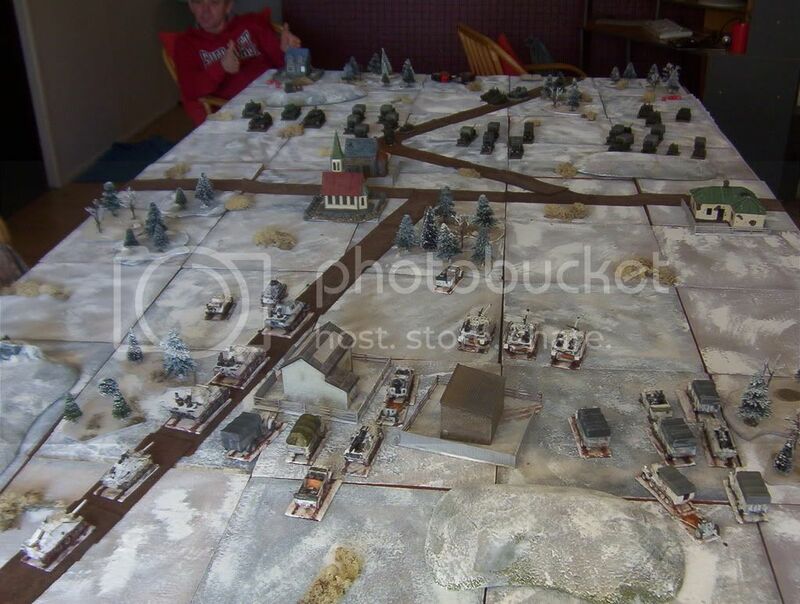 The SS begin the task of retaking Budapest as elements of IV SS Panzer Corps head for Biscke. On the left and centre are the armoured units of 5th SS Panzer Divison Wiking accompanied by the 1st Battalion of the Westland Panzer Grenadier Regiment (as Tank riders). In the centre and right are elements of the Kampfgruppe Ney. 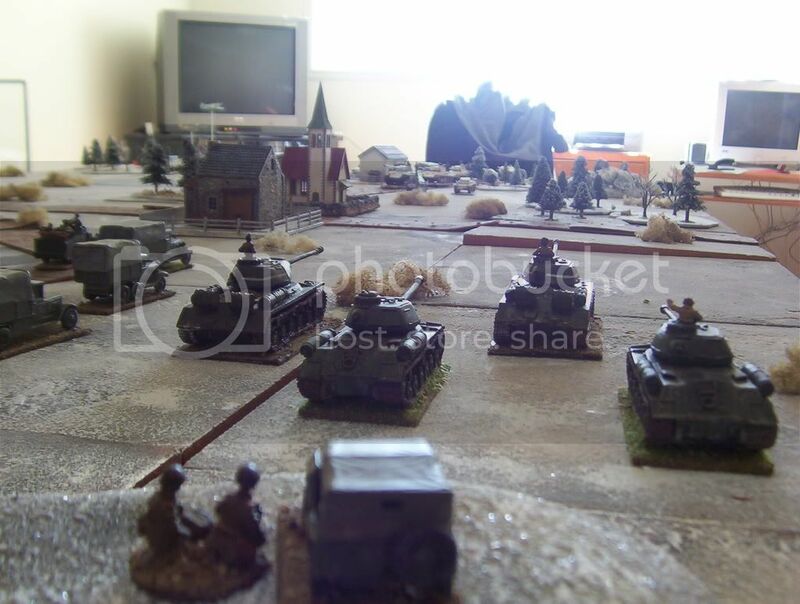 Unfortunately the SS are about to run into this little lot, elements of the Russian 18th Tank corps. 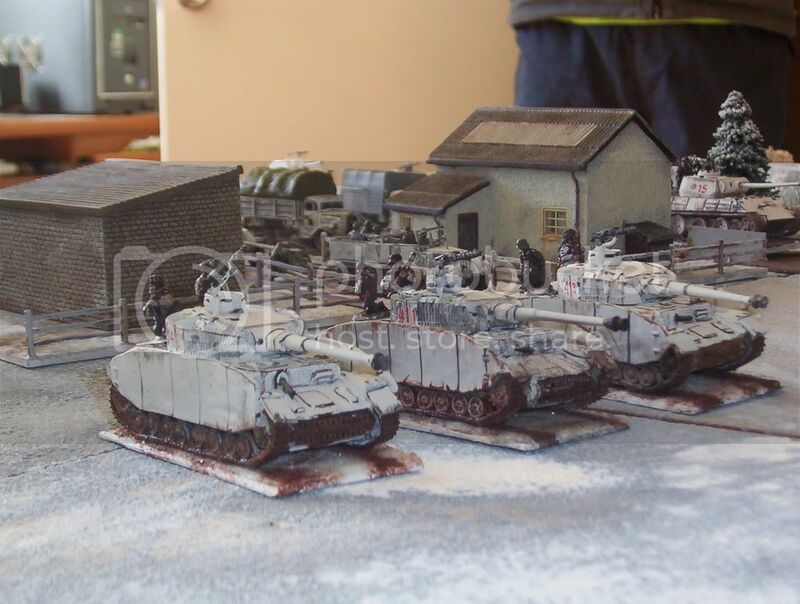 From left to right we have in front the Guards Motorised Rifle brigade (3 Battalions) followed by 2 Light SP Regiments of SU76i’s while on the right flank is the Heavy Tank Regiment of JSII’s. The Panzer IV company of Wiking moving forward boldly to crush Ivan under their Iron shod feet, “on to Budapest” was their catch cry. Of course they are about to drop their tank riders from Westland like so much garbage at the village they passed through after seeing what happened to their sister company on their left. “What the Heavies saw” or rather what they didn’t see after their opening round of firing was a Panther and Lynx dispatched at long range. This gave the Germans pause and Budapest began to recede ever further away. However stiffening their resolve and remembering they were SS they shrugged this set back off and resumed their advance. The OP for the Katyushas can be seen in the foreground, more of their service in this battle later. 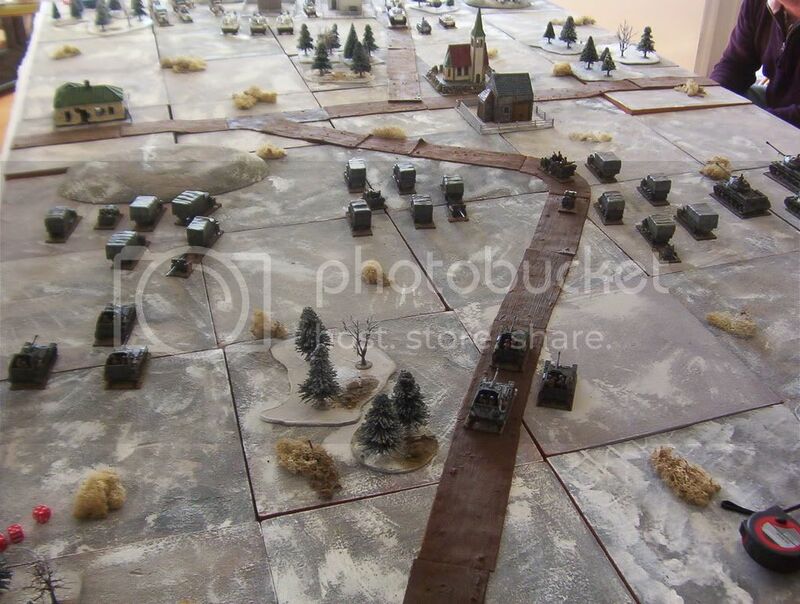 OK now the Russians are not playing nice, a gun line was formed in the centre and left flank (Russian left that is) of 4 SU76i’s and 2 x 57 mm ATG’s. 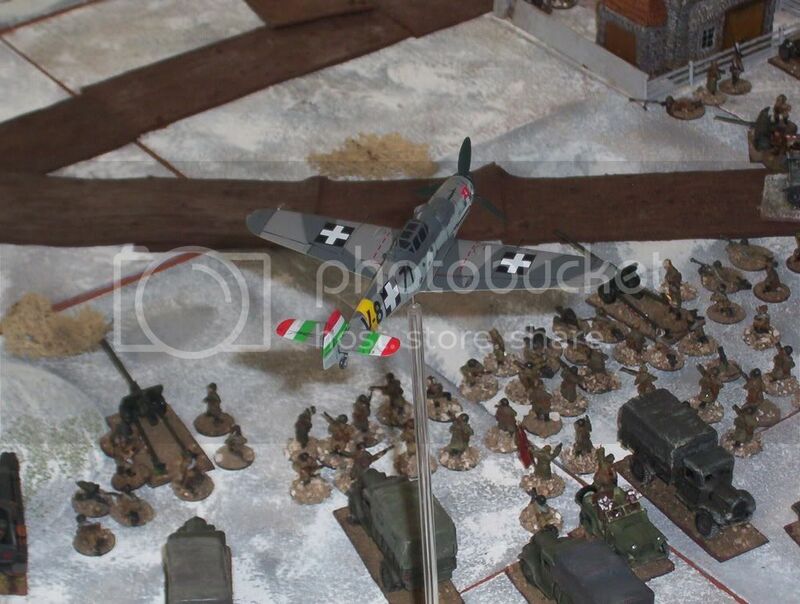 This let fly at the Panzer IV’s and they did not like it as Lance Corporal Jones would say. 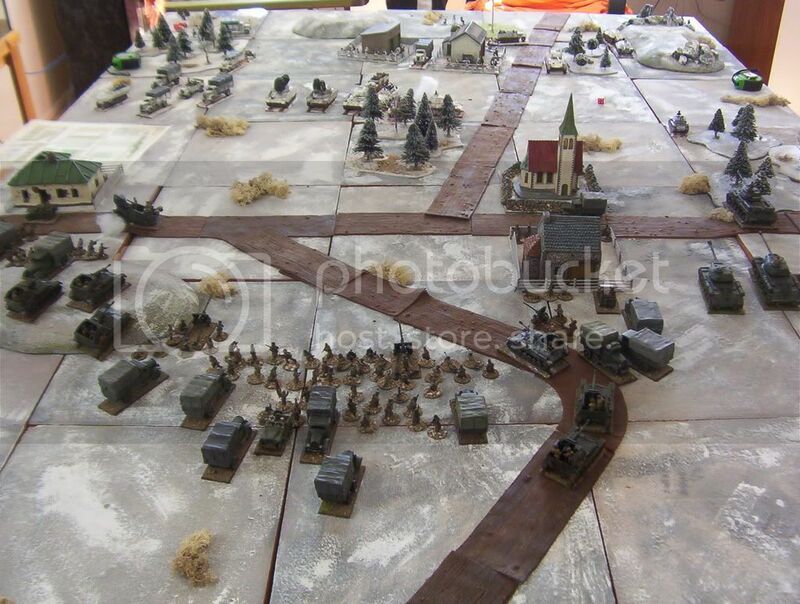 Budapest was now out of the picture and the SS infantry with only minimal losses decided to go firm and defend their territory to the last cartridge. The order was passed and an advance to the rear was executed. A view from part of the gun line, and the Russians rejoice as more of the Hun taste Russian steel. It’s Kursk all over again comrades. Of course it could not all go the Russians way and the Germans cause heavy damage to a JS II and the crew promptly abandon it. However the other Russian Tanks continue to move forward with infantry support aplenty. The Panthers have gone to ground in forests and are beginning to be annoying to say the least. From behind Russians lines the Gun Line can be seen clearly in the centre and left with the Heavy Tanks on the right. 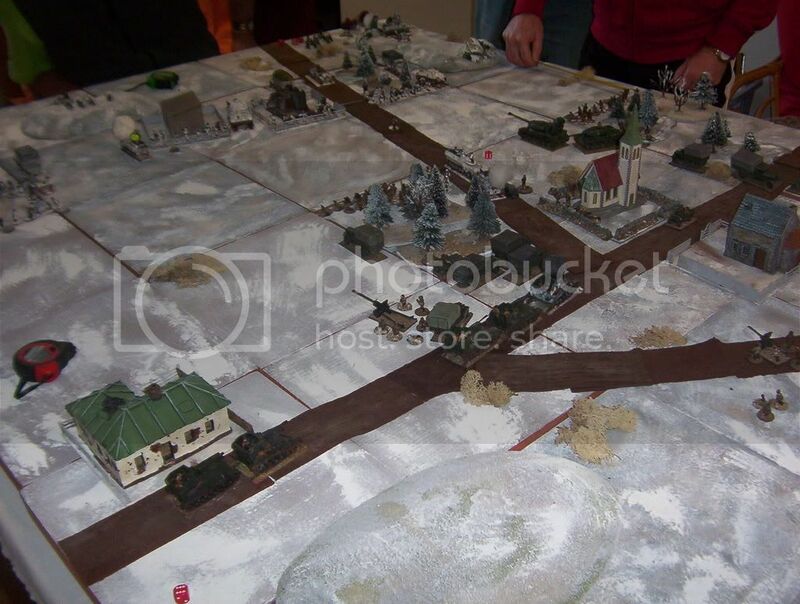 Russian infantry have rushed ahead in the centre to occupy the village. On the extreme left flank Russian infantry are also pushing into a Hamlet lead by their commanding officer and his HQ element. The Hungarian/German infantry is also making for the same target but soon decide that the forest behind them is a better destination after seeing their supporting Tanks getting knocked about. Just when they thought that things couldn’t get any worse for them the Germans get attacked by a Yak in the back (so to speak) with a Yak 9T conducting a strafing run on the German rear areas. It killed several crew from one of the heavy weapons companies but more importantly destroyed both tubes of their Mortars. The aircraft then exited off the board and was not seen again for the rest of the game. 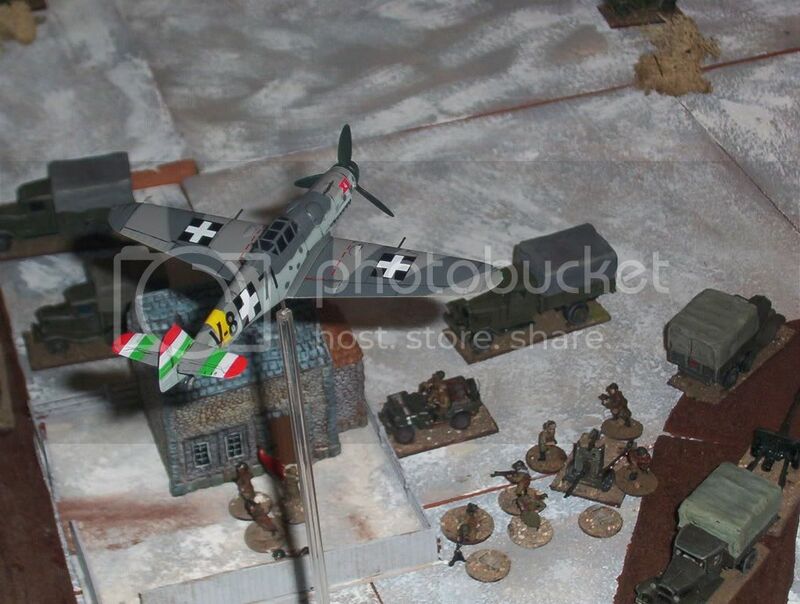 Just to prove that they had an air force too the Hungarians had an ME109G fly over the now infamous Russian Gun Line and cause carnage and general mayhem (well ok it only caused one casualty – but it showed solidarity with the ground troops). Once the Russians had stopped laughing it was time to get on with the serious business of bashing the Hun. Flushed with success on the left flank it was full speed ahead for the Russian advance. The Germans had managed to lob Mortar rounds into a peace loving member of the soviet armoured forces and destroyed an SU76i causing a reaction test for the other members of the regiment which they promptly failed and turned tail to think through their commitment to the cause. However the other regiment of SU76i’s plus the antitank guns had managed to dispatch the disabled Panzer IV’s and the remaining Panzer IV remembered that it had a pressing engagement elsewhere and headed back to the village. 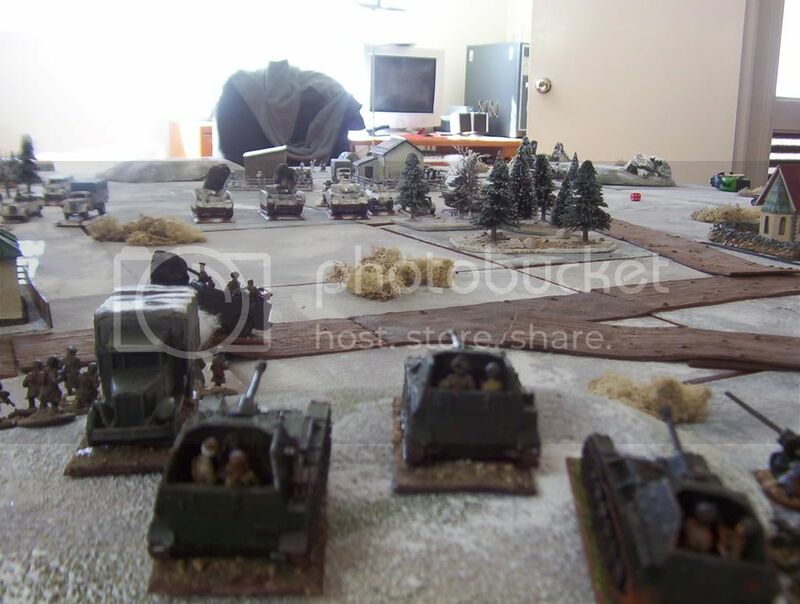 Meanwhile the 1st Battalion of the Guards regiment feeling six tall and bullet proof press forward past their initial objective and make for the woods supported by the second SU76i regiment. The Germans in the centre were now in the trees and looking to cause as much trouble as they could. Nice paint job but couldn’t knock the skin off a custard was the Russian assessment. 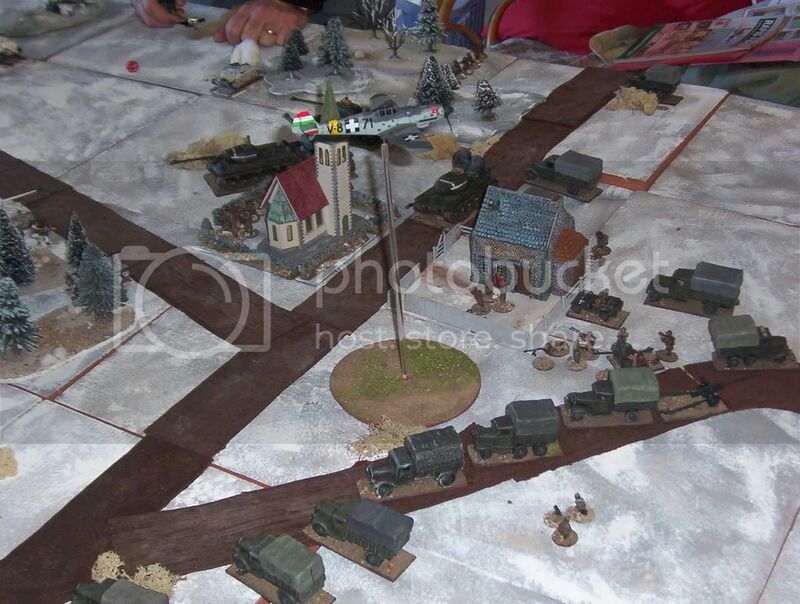 The Hungarian air force makes its last appearance, this time swearing to “shoot up those Russians but good”. However they fail to spot a single target, once again halting the Russian advance as we wipe tears of laughter from our eyes. However stubborn defence on the Russian right flank has slowed the Heavy Tanks to a crawl. They lose a JSII destroyed but the Germans have another Panther destroyed as well as damage to their last Panther and a Hetzer. 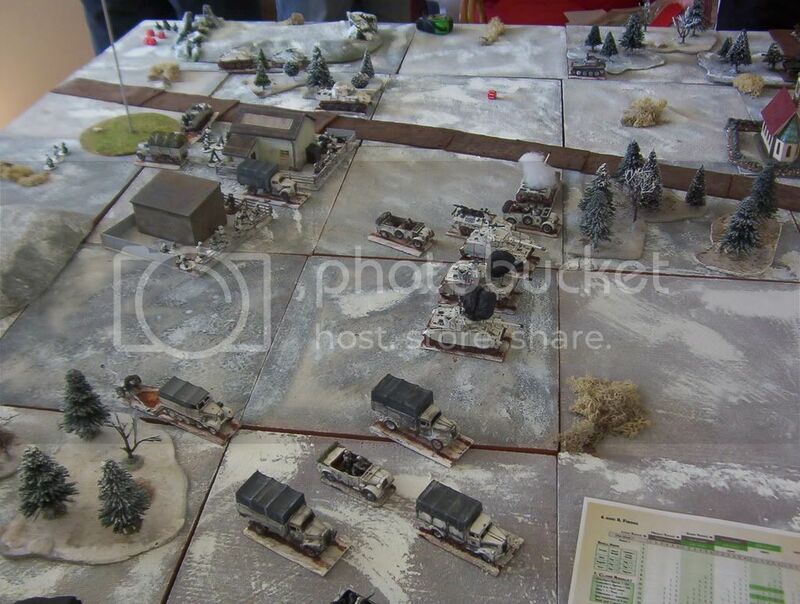 At the bottom of the Photo the Gun Line is being dismantled as the Russian commanders spur their units on to advance while the Germans are reeling from the loss of their tanks. The Germans are not giving in to the Russian forces and make them pay in blood for every yard. A nasty little cross fire is set up and the JSII’s are slowed as no one wants to be the first into this trap. 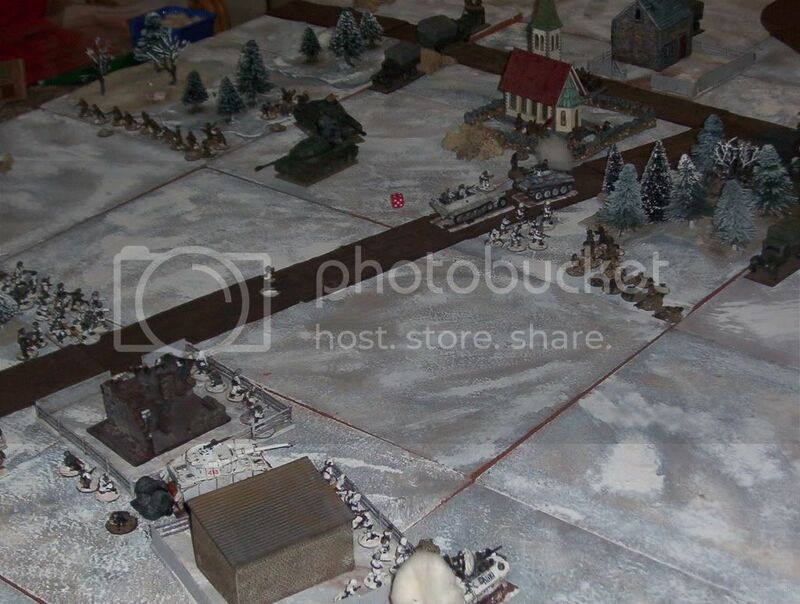 Russian and Hungarian/German infantry begin exchanging shots in the central forest and village for the first time. The Russian left meet with a set back with an entire company disappearing under the Mortar barrage laid down by the supposed beaten Hungarians. Never the less the remaining companies dismount and prepare for the final assault. “One good push will see victory lads” yells their commanding officer. However they can not help notice that he has stayed in the Hamlet he courageously took earlier in the game against nil opposition. Also they notice that their assault guns have bugged out after suffering a loss from a combination of ATG and Tank fire. The 2nd Battalion is now approaching the central woods getting ready to beat the brush to flush out an infestation of Nazi’s (quite nasty I hear if you are not careful). 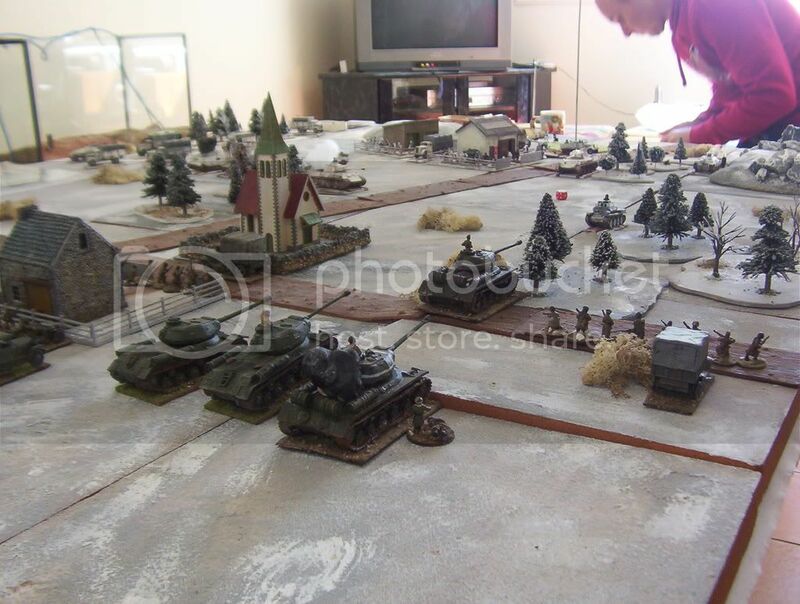 On the Russian right they have drawn straws and the heavies have pressed forward into the valley of the shadow of death to take on the remaining German AFV’s. The result of the death or glory charge by the Russian heavies, 1 JSII destroyed, 1 JSII heavily damaged against a Hetzer and a Panther destroyed (It had taken four hits and destroyed two JSII’s - Knights Cross with Oak Leaves material). The Russian Guards attacking the forest on the Russian left found out that, while they were indeed six foot tall, they were not bullet proof. They received withering fire from all points of the compass from every German or Hungarian who had a gun to fire (or an axe to grind for that matter). The German 38T recon tank lived on and was proving to be one big pain in the posterior and German and Russian infantry continued to dispute ownership of the central forest. The command group of the Westland regiment had tried to pull back from this fight only to be shot up by Russian anti tank rifles (useless against most things they were very useful for shooting up staff cars and trucks) with four out of five becoming casualties (the survivor can be seen in no man’s land in the middle of the road – not a great place to be). The Infantry on the Russian left ran after horrendous casualties. The first SU76i regiment had received a visit from their local friendly NKVD unit and was convinced to rejoin the festivities. 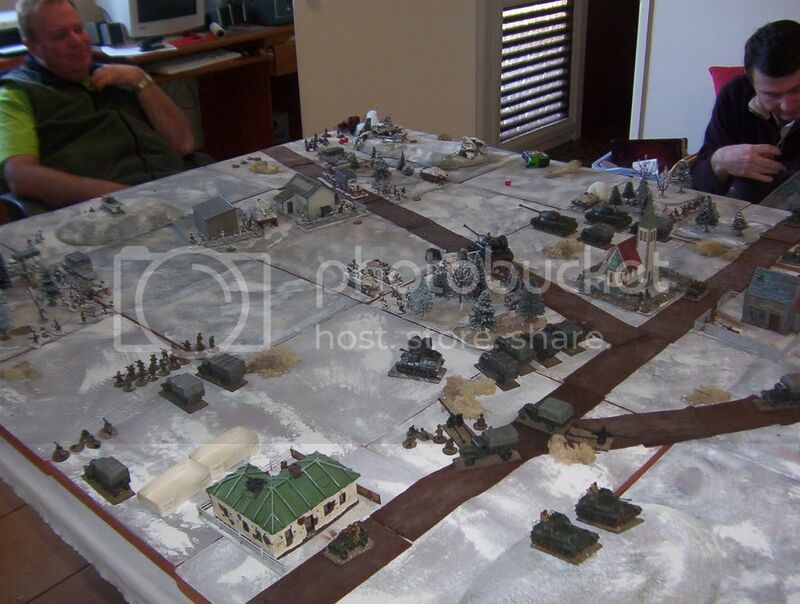 They were switching to the new main effort on the centre right of the Russian position with the other SU76i regiment ready in the centre rear area of the Russian lines. The 2nd battalion of the Guards was forming up behind the woods while the ATG watched the German lines to dissuade any local counter attacks. The central forest was still being contested by the Russian and German infantry but numbers were beginning to tell on the Germans and they were looking for an exit strategy. The surviving Russian heavies were preparing to move forward with infantry support while the Russian artillery OP was preparing a fire mission for the next phase of the assault. The artillery had suffered atrocious luck during the action with faulty lend lease radio’s from America (%#$^ capitalist dogs) continuing to break down. Either that or the half bottle of vodka the commander spilled on it earlier in the game. In the entire game they had fired twice and destroyed a grand total of one empty German truck. Still better than the German artillery – oh that’s right they didn’t have any – shame!! However the Russians had run out of time (but not Huns the thrash thank heavens). A great game well played by both sides. Hey Cardinal any chance you can make this go away and direct me where I need to go (be nice now) to find out how to post images correctly please. Just edit the beast down to the bones, blossom. The half-life of a post being what it is, I don't think anyone'll mind. Friendly Fire wrote: Hey Cardinal any chance you can make this go away and direct me where I need to go (be nice now) to find out how to post images correctly please. Looks like you pressed the IMG button when you shouldn't have. starkadder wrote: Suffer in your underpants! You want to re-assess that comment, starky? I had a similar experience a while back. Now I specialise in blurry photographs taken late at night without benefit of sobriety. I can post 'em all right. You just can't work out what they are. sorry I don't actually understand your request..it all looks fine to me..
You been up late, Biggles? no but I have been up in sydney for two days..and what is the problem with the post..it actually does look fine to me..and I still don't understand the request ..what am I supposed to maake go away? and posting pics is something we all have to come to grips with..that said looks like a very good game..
Well Cardinal it seems to have fixed itself up. When I first looked at the post on my computer it was all text with only one photo showing. I think my service was just a little slow downloading all the pictures. Still alls well that ends well as they say. I have a new camera so I will try to document more of our games and give an unbiased appraisal of both sides efforts. Either that or really sink the boot in depending on if I win or lose. Cacadores wrote: Looks like you pressed the IMG button when you shouldn't have. So did you fix it Cacadores? What should I do in future? well g0o back to the post and hit the edit button and see the code for the pictures as it is now and compare it to how you remeber it when you did it..it would seem you doubled up the img thing.. photo storage now has a one paste mode that allows a cut and paste ,that wasn't always around, and it seems you cut and paste and hit the IMG button on the reply toolbar..which buggers the simplicity of it.. It was a great game, interesting to play the Russians after my last fiasco, what was that scenario called? 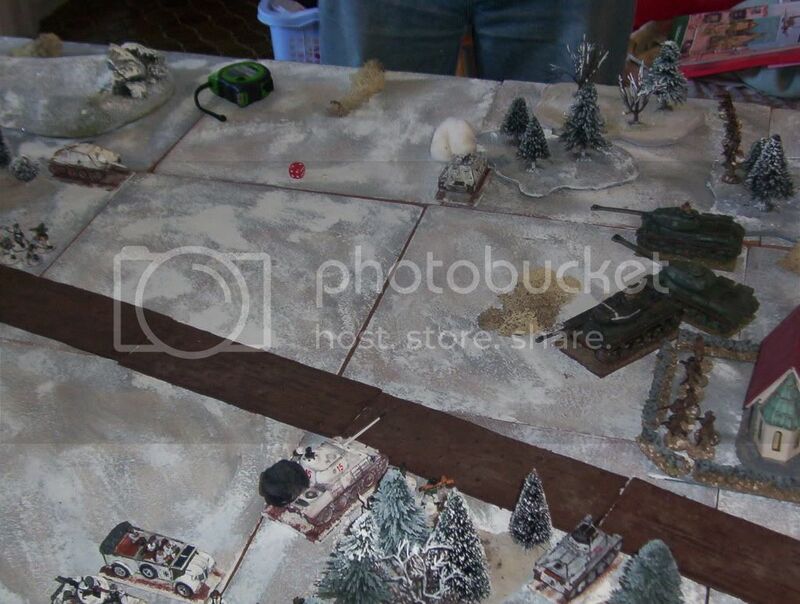 The Germans had Tiger II's and Panthers in ambush positions and the Russians roll on with T34/85's and T34/76's. That was not a fun game to be Russian. Now I know how the ducks feel at the shooting gallery!! Also mate I think it was the first time we had teamed up together, at least the first time in a very long time. We did quite well I thought overall, perhaps I was too cautious with my tanks and overzealous with the infantry. Next time I should probably try that in reverse. And it was true that the Artillery was not kind to us but you did a bang up job with the Yak.